By: Ginny Marvin and originally posted on SearchEngineLand. In seven days, the email says, Google Ads reps will start making changes to advertiser accounts if advertisers don’t opt out. This article has been updated with additional details and a statement from Google. 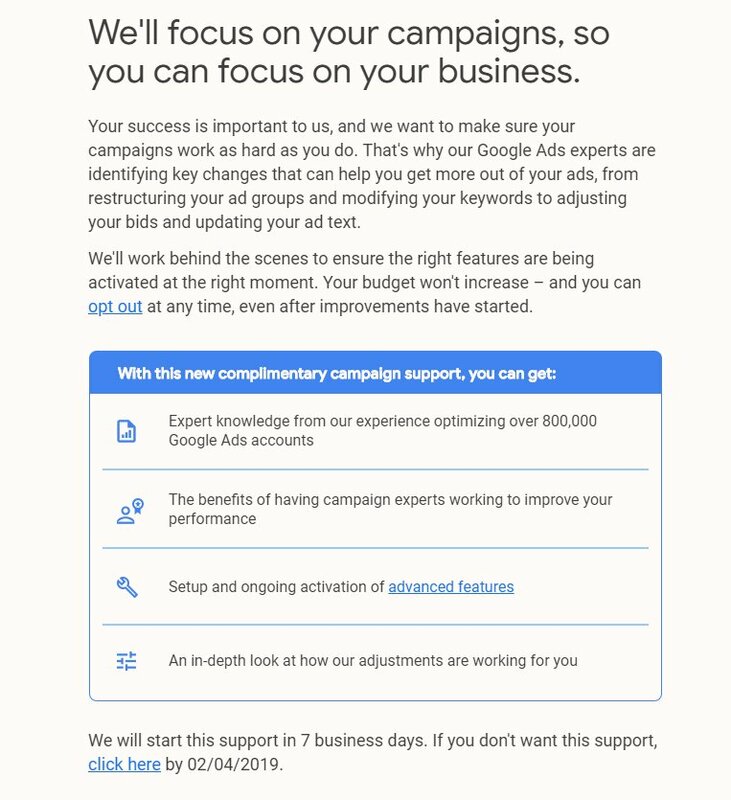 “We’ll focus on your campaigns, so you can focus on your business.” That’s the headline in an email some advertisers have begun receiving from Google Ads this week. Why you should care. Google has steadily introduced automation to just about every area of campaign creation and management (Ads Added By Google, Smart Campaigns, Local Campaigns, Universal App Campaigns, Responsive Search Ads, Smart Bidding Strategies — you get the idea). But this effort is ostensibly human-powered. Google is bringing in “Google Ads experts” to manage campaigns “behind the scenes.” One can assume, however, that the changes the experts make will be largely influenced by Google’s machine-powered recommendations engine. This kind of program will have immediate implications for the advertisers that have this service turned on, but there are longer term implications for the broader ecosystem of agencies, consultants, clients and paid search practitioners. Auto opt-in. Better check your email. Unless they opt out, advertisers will be added to the program automatically after seven days of receiving the email. However, Google notes it is possible to opt out later at any point. What will these experts be doing? According to the email, they’ll identify “key changes that can help you get more out of your ads, from restructuring your ad groups and modifying your keywords to adjusting your bids and updating your ad text.” That’s structure, keywords, bids, ads. They’ll also offer “setup and ongoing activation of advanced features” and “ensure the right features are being activated at the right moment.” What they say they don’t touch are budgets. Aaron Levy, director of PPC at Elite SEM, tweeted the email Google is sending out to some accounts. Is Google undercutting agencies and consultants? Google has long had account reps and teams that reach out to advertisers (and agencies) with optimization recommendations and account consultations. It is also not uncommon for agencies to complain that Google reps have reached out to their clients that clearly have accounts under the agency’s management. Whenever pushed on this, Google’s response is that it partners closely with agencies and consultants — through its partner programs, outreach and other efforts. With this program, the thinking goes, agencies and consultants that have advertisers participating in the program could dedicate more time to strategy and spend less time on tactical workaday tasks. Advertisers in the program will be notified of suggested optimizations and new features via email and can opt-out at any point. It’s not clear what experience or training the Google Ads experts who will be optimizing campaigns have. Google does tout the knowledge it has gleaned from “optimizing over 800,000 Google Ads accounts.” The company has millions of advertisers, and again it’s unclear what kinds of accounts these are and what kind of hand Google has had in optimizing them. It should also be noted that if the recommendations have a negative impact on results, Google may offer refunds to advertisers. A copy of the email message is below.